Throughout the nineteen sixties and seventies Jean-Louis Levesque was one of the more successful owners/breeders in Canadian racing. He built his racing stable with astute purchases of yearlings bred by E.P. Taylor when he began his foray into racing. From many of the yearling fillies he purchased, Levesque bred them to first class stallions once they became broodmares. He campaigned he likes of world class champions Fanfreluche, L’Enjoleur, La Voyageuse, La Prevoyante and L’Alezane. The latter two also became the most devastating losses to this enthusiastic turf patron. La Prevoyante was bred in 1970 and was the third of seven foals from Levesque’s broodmare Arctic Dancer. Arctic Dancer was a full sister to the great Northern Dancer. She was purchased by Levesque as a yearling from Windfields Farm for $100,000 in 1964, a record at the time. Arctic Dancer made two starts as a two year old, finishing second in the My Dear Stakes in her début and then injuring herself in her next event. She was subsequently retired to become a broodmare. Of the seven foals produced by Arctic Dancer, four were sired by Buckpasser. La Prevoyante was the first from the Buckpasser/Arctic Dancer partnership. Beautifully conformed and possessing a wonderful temperament, the lovely bay filly would have one of the greatest two year old seasons in racing history. Levesque had as his stable trainer John “Yonnie” Starr, who prepared the filly for her début. John Le Blanc was her jockey for most of her career. 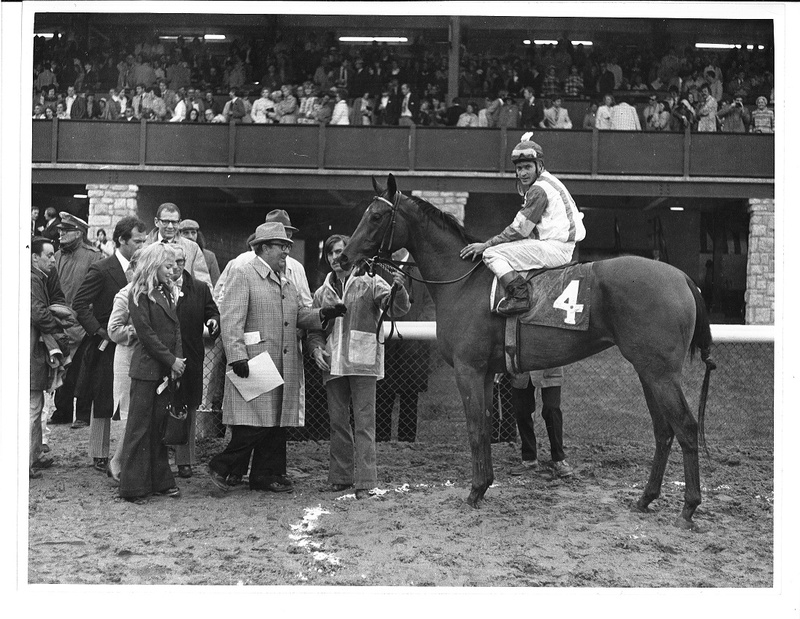 La Prevoyante burst onto the scene on May 31, 1972 at Woodbine when she pulverised a field of two year old filly maidens. The Levesque home bred won the five and a half furlong race by eight and one half lengths. The performance was a harbinger of things to come. After winning her next race, a five furlong allowance on grass, La Prevoyante won her fist stakes race capturing the My Dear Stakes at Woodbine. As it would turn out, the daughter of Buckpasser was just getting warmed up. She won the Fleur de Lys Stakes at Blue Bonnets over a solitary rival by nine lengths and then clobbered the boys at Fort Erie by five lengths in the Colin Stakes. La Prevoyante then turned her attention to the U.S. and shipped to Saratoga. At the famous spa, she became the talk of the backstretch while dominating in the Schuylerville and Spinaway Stakes. These wins were before the advent of grading races, but the Spinaway has always been a top drawer race for two year old fillies. La Prevoyante’s combined margin of victory for the two Saratoga events was nine lengths. As impressive as these races were, the best was yet to come. Returning to Woodbine, the emerging star took on the best of the Canadian juvenile fillies in the Princess Elizabeth Stakes. This was, and always has been, the top race in the division. La Prevoyante simply toyed with the field, winning by seven and a half lengths. She was ten lengths in front at the top of the home stretch and cruised home unattested. With nothing left to prove in her home country, La Prevoyante went back to the U.S. What transpired on her return to the states was simply astonishing. The four most important races for two year old fillies in the U.S. are the Matron, Frizette, Selima and Gardenia Stakes. Le Prevoyante swept them all. But it wasn’t just that she won, but the manner in which she won. In the Matron, La Prevoyante zipped around the Belmont track in 1:23 3/5 and won by seven and a half lengths. In the one mile Frizette, she won by two lengths on a sloppy track. At Laurel she sped around in 1:46 2/5 on a sloppy track to win the Selima by fourteen lengths. Finally at Garden State, La Prevoyante took the Gardenia by two lengths after being in front by as much as eight. She just coasted to the line with plenty energy to spare. The most remarkable aspect of these wins was that she was never headed in any of the races. La Prevoyante won the Eclipse Award as a foregone conclusion. She was not only the unanimous winner of her division but she also finished second in the Horse of the Year ballot. Who beat her you may ask? Well it was a certain juvenile chestnut colt named Secretariat. Only an immortal legend could prevent the Canadian filly from becoming Horse of the Year. This was the first time a two year old won the Eclipse Horse of the Year Award. Unfortunate timing on her part. Let’s compare the two. Secretariat had lost his first start as a two year old. La Prevoyante did not lose at two. Secretariat also had a win taken away due to interference. La Prevoyante was never seriously challenged enough to get into a close situation. The filly won on a variety of surfaces and conditions. To this day many feel that La Prevoyante should have won the top award. She did garner the Horse of the Year award in her native Canada as consolation. Fans and the press could not reap enough praise on the pair. There was much anticipation that La Prevoyante and Secretariat would meet somewhere during the next season, perhaps the Kentucky Derby. Many romantic fans were hoping the two would get together after racing and make babies. Jean-Louis Levesque did buy a share in the breeding syndicate to Secretariat over the winter and confirmed his intention to breed his champion to the Meadow Stable champion after her racing career. Alas it would not come to be. During the winter there was much ink used to write about La Prevoyante. She was not only the darling of Canadian fans, but also to American turf enthusiasts. It was revealed that she had a sweet tooth and loved to snack on candy, Tootsie Rolls in particular. She was known around the barn as “Tootsie”. Her sweet nature endeared her to everyone, and her gorgeous looks and success vaulted her to star status. Stunningly, La Prevoyante was beaten in her first race as a three year old, a six furlong allowance race at Gulfstream. Bold Memory rocketed out of the gate and never looked back, setting a new track record in the process. La Prevoyante could not keep up. Although disappointed, Yonnie Starr still thought it was a good effort saying “she was a little short in fitness”. La Prevoyante rebounded with a smooth victory at Keeneland in her next race and then just hung on for the win in the La Trioenne Stakes. However cracks in her superiority were beginning to show. She could not maintain her clear advantage in the Kentucky Oaks and finished second to Bag Of Tunes, five lengths back. Tootsie came back to Canada to cruise to a three length score in the Québec Derby. Next up was the Canadian Oaks and a chance to re-affirm her superiority. The race drew a strong field. La Prevoyante blasted out of the gate and at one point was nine lengths clear of the field. However she could not sustain her speed and tired in the stretch. The excellent filly Square Angel passed her and then Impressive Lady caught Tootsie at the wire for second. Try as she may, La Prevoyante just did not have the stamina to blaze nine furlongs in top competition. One week later she was in the gate for the Queen’s Plate. The track was a sea of thick heavy mud on a dreary day. La Prevoyante pressed the pace but just could not get hold of the slippery footing and finished ten lengths back in eighth place. The race was attended by Queen Elizabeth II and Levesque was hoping to meet her in the winner’s circle to accept the trophy. The appropriately named Royal Chocolate splashed through the murky mud and gave his owner Jack Stafford the honour of receiving the Royal award from the monarch. Tootsie never seemed to recover the brilliant glory of her juvenile season. There were flashes of her greatness on occasion, but she could not sustain it. She made nineteen more starts over the following nineteen months. She never won another stakes race, but did place in several. It seemed as if the magic had left her. La Prevoyante won several allowance races by wide margins, but she could not put it all together in stakes company. It was baffling to say the least. Although she was no longer the superstar of her division, La Prevoyante remained a very popular and well loved filly. Fans still flocked to see her in the walking ring, admire her beauty and bet with their hearts. Tootsie made thirty-nine starts in her career and was sent to the post as the favourite thirty-five times. One race was a non wagering event because only one other horse was brave enough to challenge her. La Prevoyante ran her final start at Calder Race Track on December 28, 1974 in the Miss Florida Handicap. That day is still painful to remember. Tootsie assumed command from the off and drew out to a seven length lead after five furlongs. The race was a one mile and one sixteenth grass race. The field began to close on her near the far turn and had caught her at the top of the stretch. Jockey Chris Rogers stated after the race, “Coming to the eighth pole I could feel her body tighten under me. I didn’t know what was wrong, but I knew she was in trouble. She finished under her own courage”. La Prevoyante collapsed just beyond the finish line. She was revived using cold water spray and then walked to the receiving barn under her own power. It was initially thought that she had suffered heat exhaustion. Back in her barn later that day, the great La Prevoyante collapsed again and died. The cause was a ruptured lung. Shaken and devastated, John Starr simply did not see this coming. “She trained so good for the race”, Starr said when interviewed. He added, “If I knew there was the slightest thing wrong with her, I would not have run her. I imagine the rupture represented a weakness in her lung which was undetected. She looked great before the race”. To add a further unfortunate circumstance to the tragedy, Levesque had earlier in the year sold a weanling full sister to La Prevoyante to French interests. The filly was named Danseuse Etoile and won three of four races before an injury necessitated retirement. Danseuse Etoile would later produce group stakes winners Drapeau Tricolore, Dampierre and Danseur de Corde. She is the second dam of grade two winner and classic placed Proud Citizen. Tootsie was gone. Her passing affected all who knew her on many levels. Jean-Louis Levesque and his family, Yonnie Starr and his staff, and the many fans of La Prevoyante had anticipated a promising post racing career as a broodmare. She was poised to be a great contributor to future offspring, had she survived. Taking into account her female family, the fact that her sire Buckpasser became one of the most acclaimed broodmare sires in history, and her own physical conformation and talent, La Prevoyante was a great loss to the breed. The Canadian Racing Hall of Fame named La Prevoyante as one of the inaugural inductees in 1976. Later she was elected to the National Museum of Racing Hall of Fame in the U.S. in 1995. Fitting honours to the filly who captured the hearts of racing fans around an entire continent. La Prevoyante was a kind and gentle soul, beautiful and very talented. Her life may have been brief, but her legend lives forever. A true “Queen of the Turf”. Watched her so many times what a beautiful mare , we don’t see that kind very often. A remarkable filly. Such a tradgic loss. She would nudge my pocket, knowing I had Tootsie Rolls for her. Loved her!! !